As we enter 2018, the final year that we will be entering with The Middle (unless it eventually gets revived, as so many shows are now), the Hecks celebrate the New Year. The episode begins with Frankie and Mike taking down the Christmas tree. Sue has a really funny line about this, "You're taking down the Christmas tree? But that's how I know that it's Valentine's Day," and then tells Frankie about what happened with her and Sean. This shows how close Frankie and Sue are, and there are some funny moments with Frankie's excitement. 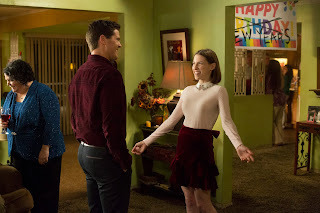 Sue worries that the kiss might not have meant anything, and Brad decides that they can test this if he kisses her at midnight on New Year's Eve. Frankie throws a New Year's party, and she and Brad try to get Sue and Sean together at midnight. Sean gets pulled away right before midnight, and it's really entertaining as he attempts to get to Sue in time. At midnight though, Sue gets kissed by someone else. But, the episode ends with Sean telling Axl that he likes Sue. Mike gets a call from his dad, who wants Mike to drive him somewhere but won't say where. Mike brings Axl and Brick with him for any potential things that they have to lift, and they try to get their grandfather to give them more than the usual five dollars they get from him, which is funny. It turns out that Big Mike wants to just die by a tree that's important to him, and it's funny when no one can think of a reason for him to keep on living. Mike decides to drive away, but he eventually returns. Big Mike hilariously seems dead when they return, but turns out not to be. Mike convinces Big Mike to keep on living by making him think about how much of a bother he would be dying instead of living, which is a great way to end this story. While I wish that the Sue and Sean story wasn't being dragged out so much, it really did feel like progress was made this week with that final scene. Mike's parts of the episode were also great, as he and his dad had some really funny moments. What did you think of "New Year's Revelations"? Leave your thoughts in the comments!